Australian made made winch rope, did I hear that right? Yes you did, we have the whole range of ropes made here in Australia by a company that has been in the rope business since the early '80s. High quality Ultra-high-molecular-weight polyethylene (UHMWPE) fibres are imported, converted into 12 strand rope by high quality machines and then they receive a special polyurethane coating to ensure long life. As part of the assembly process, high quality and high visibility protective sleeves are used to protect the eyes and leading section of each rope. The ropes are available in five popular colours, blue, grey, orange, purple and yellow. This helps get the maximum life from any winch rope. This rope has a breaking strength of 9,000 kg [19,800lbs] which is far stronger than cable of the same diameter. 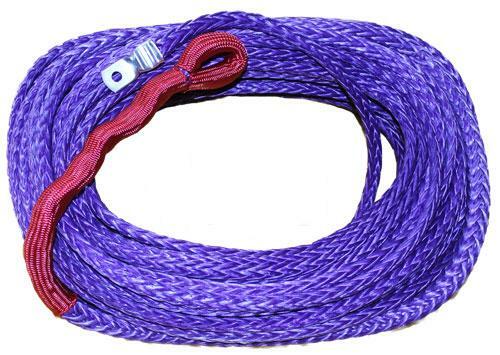 We recommend these winch ropes for the recreational four wheel driver where cost is the main consideration. For competition or extreme use, we recommend Supermax or Dynamica ropes. Why is winch rope better than cable?